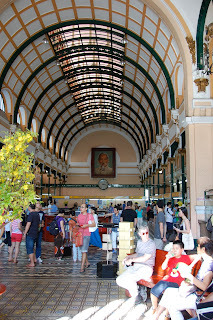 That last big stop on our tour was Ho Chi Minh City - formerly known, and still known to many, as Saigon. 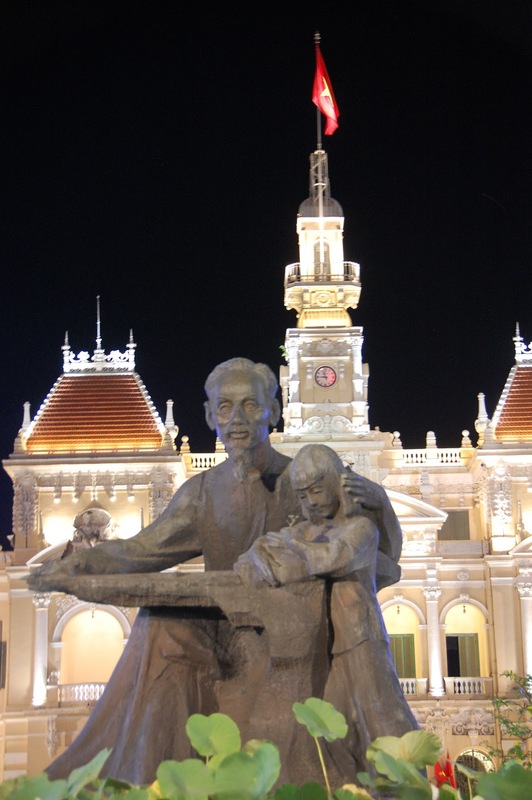 As the former capital of South Vietnam, it's got a lot of things that a typical capital city would have such as a palace, post office, cathedral, a palace, and plenty of statues of Uncle Ho (added after the war of course). For this post, I'll focus on the most impactful site for me - the War Remnants Museum. If you're visiting Saigon, you must visit this museum. The overall aim is to bring the atrocities of war to light and to deter future generations from engaging in similar conflicts. It's a multi-level building with a collection of military vehicles outside, an exhibit on the torture camps for POWs in South Vietnam, a photo exhibit on civilian massacres, photos of soldiers and the effects of Agent Orange, an exhibit on the worldwide protests against the war, and a special (and perhaps rotating) exhibit that was on the life of school children during the war. Flamethrower used to decimate foliage. Not sure what type of tank we've got here. Sign on the outside of the museum. "Tiger Cages" were used in the POW camps by the South Vietnamese as a form of torture to get information. Prisoners were held in these naked and exposed to the sun. Photo of "Uncle Ho" visiting a school with children that have entirely too much make-up on. Statement from the North Vietnamese voicing their thanks for support from other countries for their cause. German posters voicing support for North Vietnam. While photography was permitted in all parts of the museum, I really couldn't bring myself to take any photos from the other exhibits. After visiting three different concentration camps in Germany/Poland and hearing the horrible stories of torture and execution during WWII, I found that the graphic pictures in this museum made a much stronger impact on me. Due to the time period of the conflict, this war was far more documented in pictures than WWII and this museum held nothing back. It was a little awkward walking through the museum as an American and knowing that most of this damage and destruction came from our troops, but at the same time I didn't feel like the museum was putting all of the blame on Americans either. They presented it as a very unpopular war that was perpetuated by a handful of politicians. From talking to our tour guide who is of a similar age, he felt like this generation is ready to move on and doesn't really hold a grudge against the USA. That was certainly a relief. We also got to tour the inside of the "Reunification Palace" that was the former residence of the President of South Vietnam. Of course the basement also included these bomb-shelter corridors with thick concrete walls as you can see. Here's the South Vietnamese flag that was taken down from atop the presidential palace. Perhaps you recognize this image from the cover of a Rage Against the Machine album or from the previous post on Hue and Hoi An. This is the monk that set himself on fire ("self immolation") in protest of the South Vietnamese leader's persecution of the Buddhist religion. The car that he used to get to Saigon is shown in the background - the same one seen in the previous post. I cannot imagine the courage it would take to make that sacrifice. View of the Reunification Palace with the current flag mounted atop. The old post office that resembles European train stations - even on the inside. I told you so. These folks may look like they're waiting for a train, but they're really just figuring out how many stamps they want to buy.......all while Uncle Ho looks over them. St. Patrick's Cathedral - just next to the post office. I want to say that this is some sort of a City Hall that looked very nicely lit in the evenings. Uncle Ho Chi Minh - again with a child on his lap, which seems to be a theme for this guy. The scooter traffic in Hanoi was impressive, but everyone agrees that Ho Chi Minh city takes the prize! 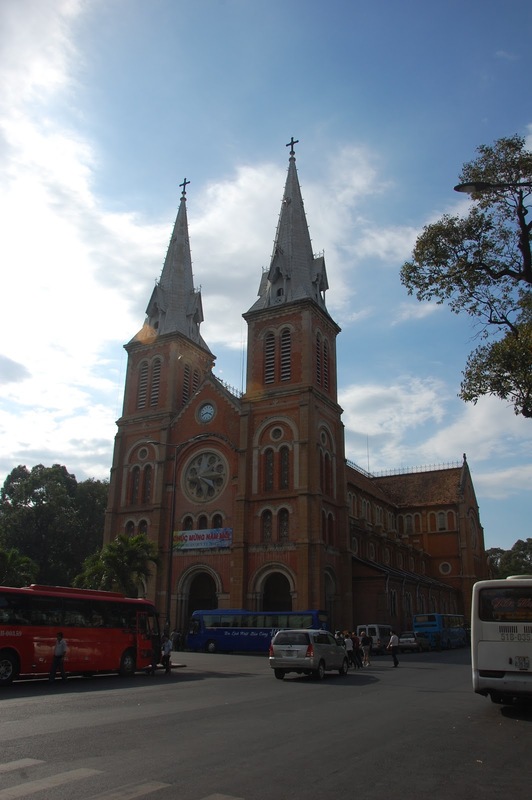 Saigon should be on your itinerary when visiting Vietnam. It's a bit livelier in the evenings than Hanoi and it feels bigger and more modern in comparison. The War Remnants Museum can't be missed and it serves as a nice launching point for day trips into the Mekong Delta.